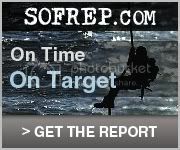 As promised I am giving my second range report on my Rock Island Tactical. This report was from my shooting yesterday(Friday) 11-05-07. I started out early in the morning at 8:00 the weather was clear and the wind was calm. My Rock has previously had 100 rounds through it with no failures to feed or hang ups of any kind. The pistol was field stripped, cleaned and lubed after my last shooting session. I changed grips for some black double diamond rubber grips with finger inserts. Shooting positions were Weaver stance or sitting with no rest. 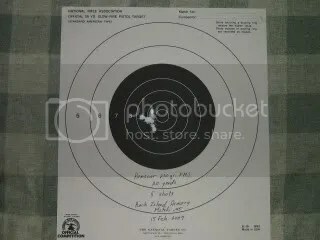 In the first target I used 185 grain SWC hand loads. 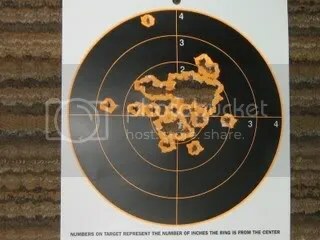 I used 230 grain round nose white box ammo with no problems prior to this outing. I was having feeding trouble throughout the shooting session with lead semi wadcutters and will discuss that later. 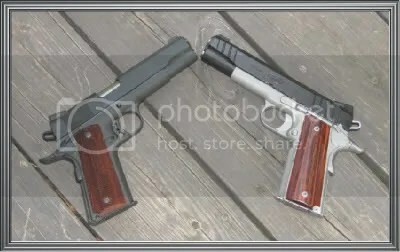 I loaded three of my own Power Star magazines with 6 rounds and the Novak magazine that came with the gun with 8 rounds. 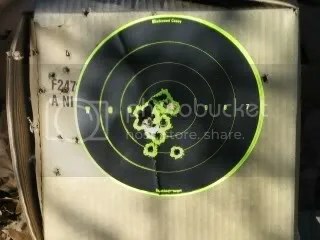 Shooting the Tactical was a pleasure and I was happily surprised at the groupings. After the initial 80 rounds the wind picked to a 5 mph breeze it was still bright and sunny. 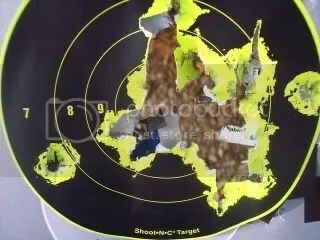 At this point I changed target and ammo to the 299 grain SWC and continued shooting, I shot 100 rounds of this weight bullet and the accuracy is still holding true. 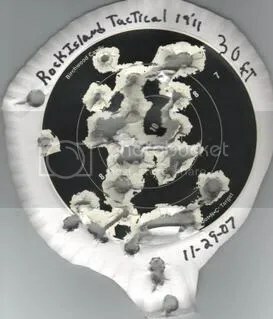 I found out that the Rock Island did not like these bullets and was still getting the same feeding difficulties. The difficulty ratio had gone down to 2 out of 8 failure to feed from 4 out of 8 failure to feed. 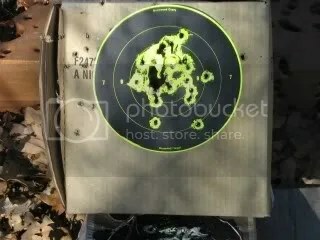 This hole in my target was getting larger so I changed to the 160 grain SWC ammo. 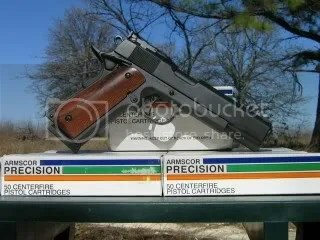 I was happy to see that I had almost no problems with this weight ammo so I proceeded to shoot 50 more rounds. I had maybe one or two failures to feed and the target will show how much my frustration had subsided. My accuracy was best using this weight bullet and it didn’t take me long to finish the whole box. 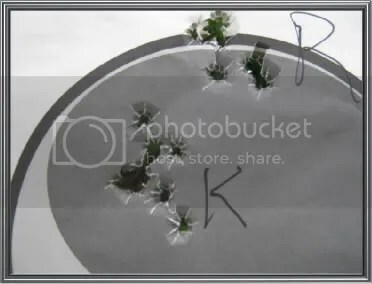 As you will see on my target, I was able to keep all of my shots within the three inch diameter target. 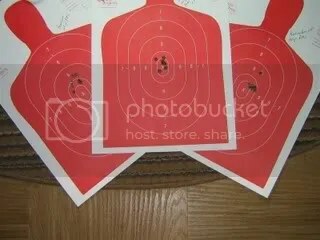 Observe also how accurate the pistol allowed me to shoot at the heart drawn on the target. I have never shot this good and am looking forward to going again. The distance for all shooting was 25 feet. I field stripped the Rock Island after shooting and found nothing wrong with the internals. Nothing loose and no metal burs. 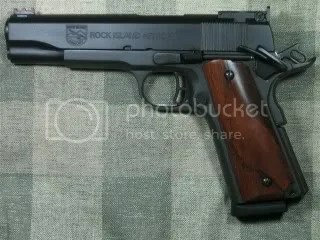 Compared to the Thompson 1911 that I own the Rock Island is much better as far as accuracy. The Rock is a lot better shooter. It’s comfort level is as high as its accuracy. I have never enjoyed myself as much as I did yesterday. Next time I go I’ll bring 100 rounds of round nose and practice double taps, I am also going to shoot rapid fire to see how the Tactical performs. I have a feeling I won’t be disappointed Well that’s about all for the range report. There was a couple of guys there that asked me to shoot it and after shooting 8 rounds each they asked me for my Center fire systems catalog because they were going straight home and order one for themselves. Another shooter turned up his nose when I told him much it cost me but after shooting it he changed his mind quick . I guess a dream job would be a Rock Island salesman:-) Phil thanks a lot for telling me about the Rock Island Tactical! It has been a valuable addition to my weapon arsenal. Above all it is a definite keeper. Horace I hope that’s not a self portrait–LOL! Just a note I’d like to add to Horaces review. This concerns feeding problems with lead semi wadcutters. 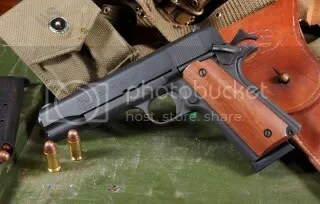 Most any 1911 will have difficulties with these type of bullets. 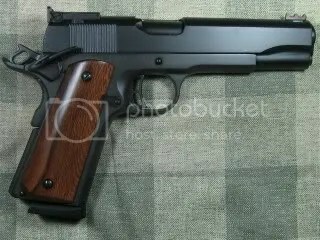 If you intend to shoot a lot of lead semi wadcutters it’s a good idea to take your 1911 to a competent gunsmith who can polish the feedramp and if needed change the feed angle to accomodate the semi wadcutter bullet. 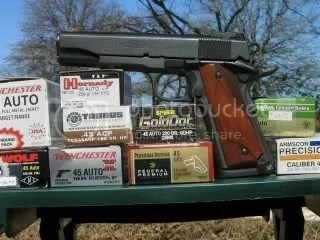 This range report is on my recently bought Rock Island Tactical 45 acp 1911. I purchased my Rock on October 17th. I bought it from CenterfireSystems and paid a total take home price of $429.00. 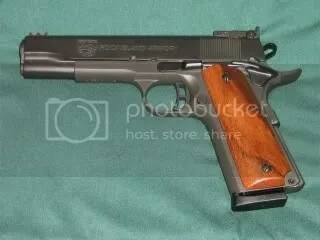 This is my second 1911. I shot a total of 150 rounds through the pistol. They are hauling dirt at the pistol range section so I measured 30 feet distance for my shooting. 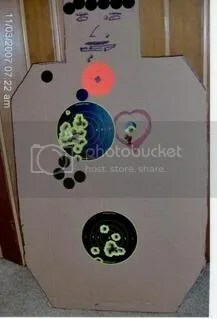 I was using a shoot n c 5 inch target. 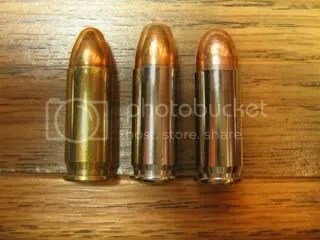 The ammo was 100 rounds of Winchester 230 grain FMJ and 50 rounds of 200 grain SWC reloads. I also had 25 rounds of Doubletap Ammo 185 grain Gold dot rated at 1225 fps from a 5 inch bbl.I figured if I can shoot this ammo then all of the other defensive round ammo would not have a problem. 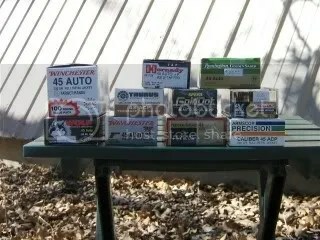 After setting up I proceeded to empty 5 different magazines on the Winchester ammo. Next I loaded 4 magazines with the reloads with the same results, not one ftf,no problems whatsoever. I shot two-handed and one handed with my strong hand. It seems that the more you shoot the Rock the better it gets. Next I tried the doubletap ammo. 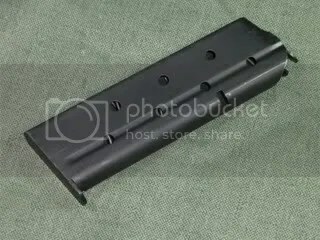 I used 5 magazines with 5 rounds in each one and shot rapid fire. I was very impressed. 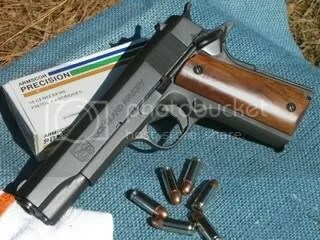 Some people that have used some of my doubletap ammo in their Kimbers and Springfields had a few problems with feeding. 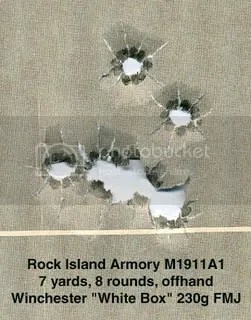 Again I must say that my Rock Island fed the high impact rounds flawlessly with no hiccups. After shooting I field stripped my pistol and checked it over with a magnifying glass. I did not find any metal shavings or cracks at all. There was the normal grime and dirt from shooting this amount of bullets and everything was in order. I have now shot over 500 rounds of different types of ammo in the Tactical and am confident enough to use it for my daily carry pistol. 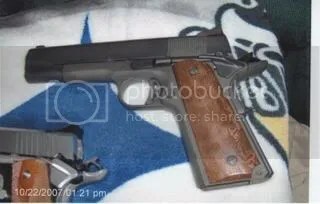 I am planning on changing most of the internals and replace the beavertail, trigger,hammer,slide stop and slide safety’s with Wilson drop-in parts. This will be done after the next 100 rounds. I will post a picture of my Rock after this is all done. One thing I did after this shooting is install a patch of skateboard tape over the frontstrap. 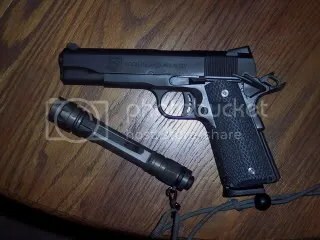 I will continue to use the black rubber double diamond grips until I can afford a set of alumna- grips for it. There is also a duracoat job in the future but I haven’t decided what color I will use on it. I want to thank Phil White for all of the assistance and guidance he has given me these past few months. He is an inspiration to me and I trust his knowledge and ability in the use of a 1911. 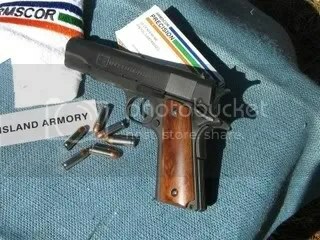 This blog is a valuable to use in the upkeep of your weapon and also a real good reference point. I hope to remain a good friend of Phil for a very long time. 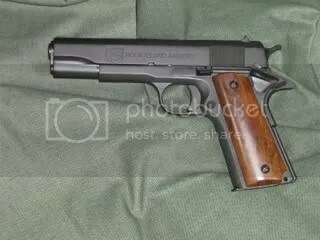 I’m sure by now you all know how much I love Rock Island Armory pistols. A short while ago I decided to refinish my Tactical model using Lauer Weaponry’s DuraCoat. 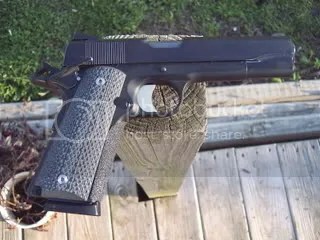 It was a fun project and one I can recommend to anyone with even a moderate amount of experience with 1911’s. I chose the DuraCoat finish after doing considerable research on the net and determined this was the best finish out there for durability and good looks. 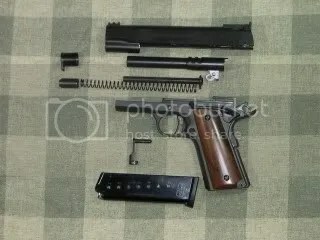 If you need help in disassembly of your 1911 check my video at the top of any page on the blog on “disassembly of the 1911”. To begin you need to get all the materials you’ll need. I ordered a 4 oz bottle of matte black liquid DuaraCoat from MidwayUsa. It comes with a 2 oz bottle of hardener. I also ordered Lauer thinner just in case the liquid was to thick for my airbrush. I got on the internet and found an airbrush with airtube for $8 plus shipping. At this point you have a choice of using an air compressor or canned air from Lauer. I already had a modeling air compressor so it was no problem for me. The airbrush arrived with two sizes of bottles for the DuraCoat as well as a small wrench to take the airbrush apart for cleaning (very important). 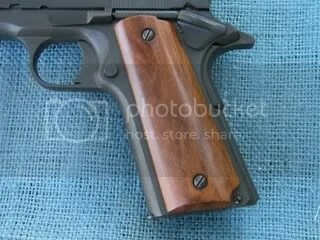 I also purchased some 1200 grit wet dry sandpaper to rough up the parkerized finish on the gun. I now had all I needed to start the project. 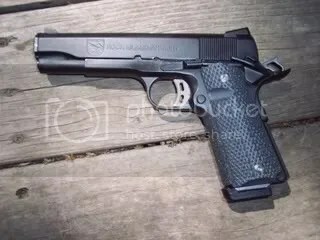 One thing I need to add at this point is something I left out on the original post that someone on the M1911 forum pointed out and that is degreasing the gun before you start to put on your spray coats. I use Break Free Powder Blast. This is much easier on you than most of the other products that are frankly pretty toxic especially if you have a breathing disorder. Break Free Powder Blast doesn’t burn your skin or cause breathing problems. After you liberally spray the frame, slide and other parts they will turn a lighter shade of gray with some areas lighter than others. Not to worry it won’t harm the gun or finish. Also, after you use the sandpaper, detailed below, you need to degrease again to remove any loose articles left behind. 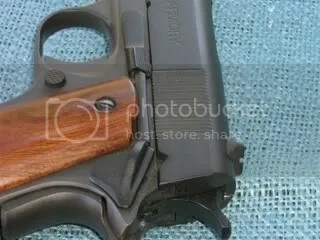 If you have a non parked gun (blued) you will need to use a little rougher grit sandpaper to strip the finish down so the DuraCoat will adhere to the steel. Once the finish is almost completely removed go back to the 1200 grit and smooth things up a little. Of course you must tear the pistol all the way down and set all the internals off to the side. You will be working on a bare frame and slide. If you don’t know how to do this don’t be tempted to spray it with all the parts in the gun unless you feel comfortable putting tape over any opening the spray will get into. Once you get all of this done it’s time to mix the DuraCoat. The mix is 2 tablespoons of DuraCoat with 1/2 to 3/4 teaspoon of hardener. Practice some with the airbrush before going on to spraying your gun. Just use some cardboard and practice from different distances as well as adjusting the amount of air you use. Before long you’ll get the right combo of air and distance. Normally about 5 to 6 inches away from your gun will be about right. You want to use light coats. Don’t be concerned with covering the entire gun the first coat you put on. If your spray is to heavy it will effect the way the slide fits to the frame as well as filling in all the nomenclature on the slide as well as filling in the serial number. After you spray the slide, frame, mag release button, grip safety and thumb safety place the small pieces on some tin foil after it dries enough not to rub off when you put it onto the foil. As you spray move the spray gun back and forth in even smooth strokes. For the slide and frame use two pieces of coat hanger (plain not painted) and bend them so you can hang the slide and frame on the oven rack. Have your oven heated to 110 degrees. After the coats are applied place them in the oven for 15 minutes. Then you remove them and hang them up to cool down. After cooling apply another coat. Remember, light coats! On my gun I applied a total of four coats. Yours may vary depending on finish. A parkerized finish is ideal for this type of refinishing. A couple of hints. As you spray you may notice the spray coming out erratically or no spray at all. At this point you need to stop place the parts in the oven as if you completed the whole part. You need to use a regular paint thinner, take the airbrush apart and clean it completely. Put it back together and test spray to get the same setting you had before cleaning the airbrush. Another small problem that may crop up is the airbrush clogging often. If this happens use 1/4 teaspoon of Lauer thinner and add it to your mix. Normally you won’t have to do this. I didn’t on mine. If you have an instance where the finish gets some gunk sprayed on it not to worry. Let it dry and sandpaper the area and just spray as usual. You’ll never know it was there. Now it may seem complicated but it really isn’t. I just wanted to make sure I covered any and all gltches you might run into. After you finish the gun and are satisfied with the results let it cure overnight before assembling the gun. I would also advise you wait about a week before putting the finished gun in a holster or shooting it. I know the Lauer website doesn’t include some of this information but from my experience it’s a good idea to be patient and allow the finish to cure even though you used the oven to cure it to some degree. The finish gets harder and more durable as time passes. It actually penetrates the steel to some degree making it adhere better over time. 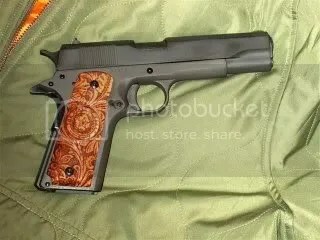 Mine has had approximately 2000 rounds fired through it since I refinished the Tactical and the finish is tough. There are no marks or signs of wear at all. I hope you have found this helpful. If you have any questions please feel free to post a comment and I’ll email you and help as much as I can. Many positive things have been written about these fine guns. Many models are available this one being the Tactical version. Without a doubt they are the finest quality guns for the price available today. Mine was $389 plus tax! I purchased mine from Cott Firearms in Marshall, MO. cottfire@iland.net. This is the best gunshop I have ever dealt with. Shawn, the owner, is a very honest person and always gives the best prices and customer service. Speaking of customer service RIA has no equal. Ivan, the north american rep, is on http://www.m1911.org everyday taking care of “his” customers and fellow shooters. Problems are almost unheard of but Ivan is a wealth of information and goes all out to give the buyer of RIA products the best personal service possible. On to the gun. I checked the trigger pull first as always. It broke right at 4 pounds and was very crisp with no creep to speak of. The ambi-safety was very positive and easily manipulated. After cleaning the gun I took it to my small range even though the temp was about 12 deg. I managed to endure the cold long enough to fire 100 rounds. I had no malfunctions of any type with some magazines of questionable reliability. Accuracy was on a par with guns costing twice the price. I paced off 10 yards. By the time I finished I placed 50 of those rounds into a hole about 2 inches by 2 inches. Very good accuracy for a gun of any price. I was using a 5 inch Birchwood Casey stick on target. I had two flyers no doubt induced by my wearing some pretty heavy gloves. One pet peeve of mine is a gun that ejects brass all over the place. This one doesn’t! Most all the brass was to the right rear about 4 feet just where it should be. Let’s put it this way. I was able to get down on one knee and pick up all the brass left over from my firing session. I ordered some Mil-Tac G-10 grips from http://www.mil-tac.com. These are some fine grips that provide a secure grip without being to abrasive. As always I put some skateboard tape on the front of the grip frame. If you’ve never tried this it’s worth giving it a shot. Most skateboard shops have scarps around they will give you. As it turns out lying your 1911 bushing wrench on the tape and cutting around the outline of the tool gives a perfect fit to the grip. Even after all the positive comments I’ve heard I was very surprised with the quality and function of this gun. 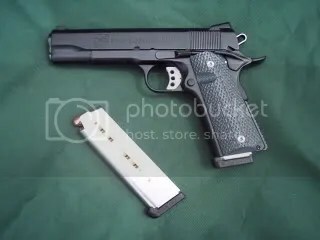 I highly recomend this gun for the first time 1911 buyer or the old experienced guys like myself who appreciate fine 1911’s. This one I’ll keep a very long time! As of now I have shot over 2000 rounds through my Tactical without any problems at all. 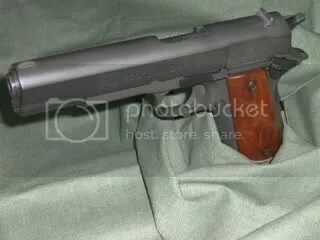 I have made some mods to the gun such as replacing the FLGR with a GI model and a hand fitted bushing. It did make it a little more accurate but you have to hand it to RIA when they put a gun together they do fit it not just throw it together. Accuracy is still on a par with any Kimber or Springfield Armory I’ve owned. 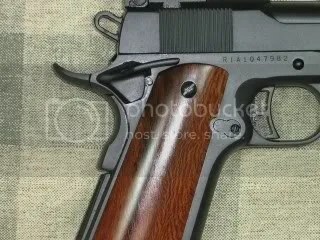 Pretty impressive for a low cost 1911 to be this accurate and durable. I’ve had 1911’s costing hundreds more and showing signs of wear and some that have started having some minor problems after 2000 rounds. Not this RIA Tactical. It just keeps on rolling along. 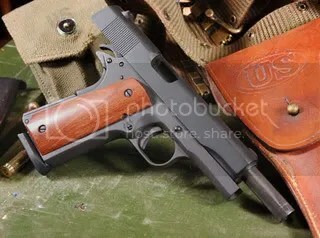 If you like 1911’s or are thinking about your first one this is one gun you need to buy–you won’t be disappointed. 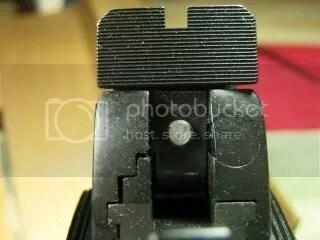 Some of us with older eyes feel the need to add a front sight with a brass bead or some type of fiber optic sight to help us pick that front sight up a bit faster. 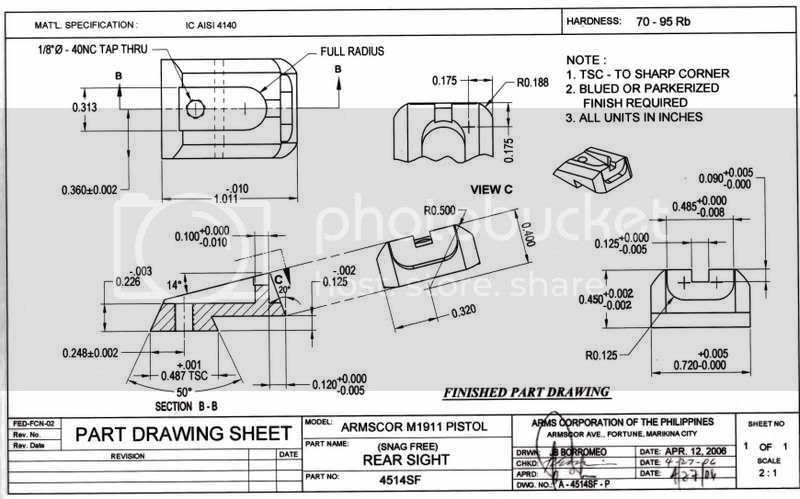 One of the guys on the 1911 forum gave me this schematic from RIA on the dimensions of the front sight. 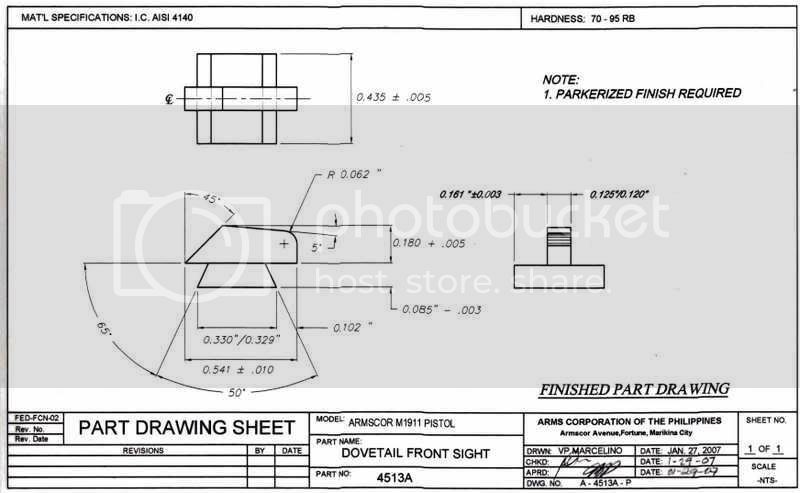 I’m adding a fiber optic on mine pretty soon and this drawing has been priceless in buying the correct sight. Remember RIA uses a Novak cut front and rear on the Tactical model. I hope you find it as useful as I did. I made a link so the schematic will be large enough to read:-) Just click on the link below. I wanted to just add a short update for those who read this review on the fine RIA Tactical. 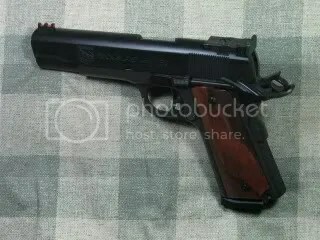 This 1911 now has just over 4000 rounds fired through it without any problems whatsoever. It’s just as accurate and tight as the day I brought it home. Prices have risen somewhat but the Tactical models are still available through Center Fire Systems for $379. Shipping is only $13 from this company to your FFL. 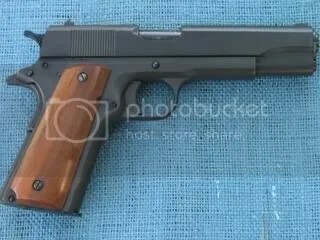 This is still the best value in price as well as quality of any 1911 period!